Having the opportunity to discuss the role of the hypothalamus and integrated thalamic function as they relate to autonomic patterned respiration, physiology, posture and central nervous system compensation, was an enduring dream of mine. I could finally, deliver a course that describes how our autonomic and central nervous systems operate with and from biased cerebral and cerebellum lateralization, hemispheric specialization, and oscillatory compression and decompression. Over two decades of literature review, clinical application, multi-disciplinary experience and evidence based outcome methodology, built with the help of an Institute I started for these course objectives, fulfilled me in ways that are very difficult to express. I trusted an idiosyncratic educational process that challenged me as a pre-dentistry student. A clairvoyant process that required collegiate patience, faith in humanity and belief in our holistic, biological and neurological system. I appreciated the 41 course ambassadors who also trusted this process. I hope they came away with a sense of how we patterned humans resolve to make sense of what we don’t sense through pattern compensation of air flow, fluid movement, and cavity fluctuation as it relates to ischial and occipital (sacral and cranial) rhythm and thus autonomic processing. This course was strengthened by the input and participation from too many people to list here, but I especially appreciated the support from Erin Coomer DPT,OCS, Laurie Gribschaw PT,DPT,ATC,AT/L,PRC, Janine Peacock DPT,OCS, Paige Raffo MPT,OCS and Kelly Martin PT. I could not have asked for a better audience and support group. 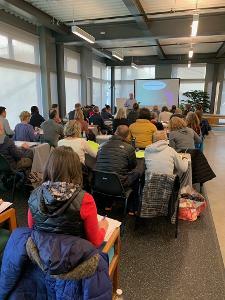 There were many reasons I wanted to give this first course in Seattle but three of those reasons are Christopher Murphy DPT,OCS,PRC, Jeremiah Ferguson DPT,OCS,PRC, and Eli Zygmuntowicz DPT,OCS,PRC. These three men are absolutely the embodiment of family. I will always be grateful for their warmth, charismatic charm and pedagogical approach. I had so much fun and look forward to the next opportunity to talk about pendular parasympathetic process.